Go to original pattern for design DROPS 174-23. Knitted DROPS men’s jumper with textured pattern and neck in rib in Eskimo. Size: S - XXL. DROPS CIRCULAR NEEDLE (40 and 80 cm) SIZE 8 mm - or size needed to get 11 sts x 15 rows in stocking st = 10 x 10 cm. 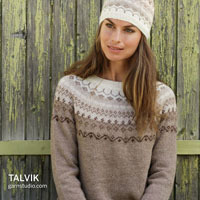 You can get the yarn to make this pattern from	36.10£. Read more. See diagram A.1. The diagram shows all rows in pattern seen from RS. 1st row in diagram = RS. All inc are done from RS. Inc 1 st by making a YO. On next row work YO twisted to avoid holes. Dec inside 1 edge st in garter st. All dec are done from RS! Dec as follows before 1 edge st: K 2 tog. Dec after 1 edge st as follows: Slip 1 st as if to K, K 1, psso. NOTE: On next row (= from WS) always work st inside edge st P (to get 1 K inside edge st at assembly). Worked back and forth on circular needle to make room for all the sts. Cast on 56-59-65-71 sts (incl 1 edge st in each side) on circular needle size 8 mm with Eskimo. Work rib as follows: 1 edge st in GARTER ST - see explanation above, P 0-3-3-3, * K 3, P 3 *, repeat from *-* until 1 st remains and finish with 1 edge st in garter st. Continue rib like this until piece measures 7 cm. Work 1 ridge AT THE SAME TIME adjust no of sts to 55-59-65-69 on first row. Now work A.1, finish with 1st st in A.1 and 1 edge st in garter st in each side. 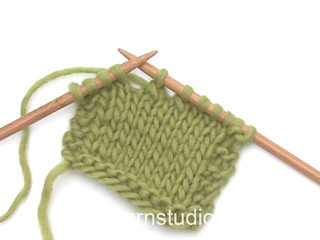 REMEMBER THE KNITTING TENSION When piece measures 12 cm, inc 1 st inside 1 edge st in each side - READ INCREASE TIP! Inc like this every 11th cm 3 times in total – work the inc sts in pattern = 61-65-71-75 sts. 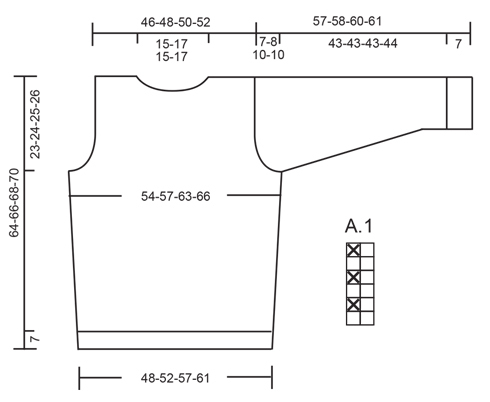 When piece measures 41-42-43-44 cm, cast off 3 sts in each side for armhole. 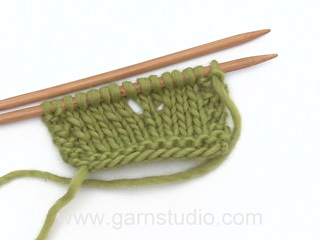 Now dec for armholes as follows - READ DECREASE TIP: Cast off 1 st on every other row a total of 2-3-5-6 times = 51-53-55-57 sts. When piece measures 62-64-66-68 cm, cast off the middle 15-17-15-17 sts for neck and finish each shoulder separately. Then cast off 1 st on next row from neck = 17-17-19-19 sts remain on shoulder. Cast off when piece measures 64-66-68-70 cm. Work the other shoulder. Cast on as on back piece and work rib as follows: 1 edge st in garter st, * K 3, P 3 *, repeat from *-* until 1-4-4-4 sts remain, K 0-3-3-3 and finish with 1 edge st in garter st. Then adjust no of sts as on back piece before continuing with A.1 and inc in each side. Cast off for armholes as on back piece and continue until piece measures 57-59-60-62 cm. 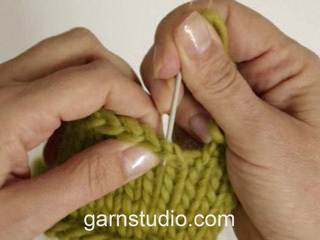 Now slip the middle 9-11-9-11 sts on a stitch holder for neck and finish each shoulder separately. Continue to cast off for neck at beg of every row from neck as follows: Cast off 2 sts 1 time and 1 st 2 times = 17-17-19-19 sts remain on shoulder. Cast off when piece measures 64-66-68-70 cm. Work the other shoulder. 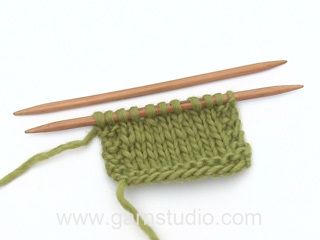 Cast on 26-26-32-32 sts (incl 1 edge st in each side) on circular needle size 8 mm with Eskimo. Work rib K 3/P 3 with 1 edge st in garter st for 7 cm. Work 1 ridge AT THE SAME TIME adjust no of sts to 28-28-30-30 on first row. Continue with A.1 with 1 edge st in garter st in each side. When piece measures 12-14-14-13 cm, inc 1 st inside 1 edge st in each side. Inc like this every 3½-3-3-3 cm 11-12-12-13 times in total - work the inc sts in pattern = 50-52-54-56 sts. When sleeve measures 50-50-50-51 cm, cast off for sleeve cap at beg of row in each side as follows: 3 sts 1 time, then cast off 2 sts at beg of row in each side until piece measures 56-57-59-60 cm, then cast off 3 sts at beg of the next 2 rows before casting off all sts, piece measures approx. 57-58-60-61 cm. Pick up from RS approx. 60 to 72 sts around the neck (incl sts on stitch holder at the front) on short circular needle size 8 mm. P 1 round while adjusting the no of sts to 60-66-66-72. K 1 round. Then work rib = K 3/P 3. When neck measures 7 cm, inc all P 3 to P 4 = 70-77-77-84 sts. When neck measures 14 cm, dec all P 4 to P 3 = 60-66-66-72 sts. Continue with rib until neck measures 21 cm. LOOSELY cast off sts with K over K and P over P - NOTE: To make the cast-off edge more elastic make 1 YO after approx. every 6th st while casting off (cast off YOs as sts). Sew in the sleeves inside 1 edge st. Sew sleeve and side seams in one inside 1 edge st in garter st.
Buonasera. Ho provato a riprodurre il modello seguendo il diagramma A.1 come da istruzioni, ma il risultato è diverso dalla foto. Come mai? Per ottenere lo stesso maglione della foto, devo usare il punto costa 1/1 oppure la costa inglese? Grazie! Buongiorno Valentina. Il diagramma è corretto e si lavora in questo modo: Ferro 1 (sul diritto del lavoro): tutte le maglie a diritto. Ferro 2 (sul rovescio del lavoro, leggendo da sinistra verso destra): 1 maglia diritto, 1 maglia rovescio. Buon lavoro! Liebe Petra, die stillgelegten Maschen für den Hals am Vorderteil werden beim Kragen aufgefassen - siehe KRAGEN. Viel Spaß beim stricken! Hola Miriam. El número de puntos para rematar la manga no es determinado, depende de la tensíon de cada uno. Lo importante es seguir correctamente las medidas de la manga en cm según el patrón o la medida deseada según la persona. Liebe Petra, bei der 1. Reihe in A.1 werden alle Maschen rechts gestrickt (= Hinreihe). Bei der 2. Reihe (= Rückreihe, jetzt wird das Diagram links nach rechts gelesen) in A.1 stricken Sie (1 M li, 1 M re). Wenn Sie mit der 1. M in A.1 enden, stricken Sie von der Rückseite: 1 M lli (= 1. M in A.1), dann (1 M li, 1 M re). Viel Spaß beim stricken! Hola Miriam. El diagrama A.1 se trabaja como sigue: fila 1: todos los puntos de derecho; fila 2 : 1 punto de revés, 1 punto de derecho. Repetir estas dos filas. Os modelos são lindos. Como faço para comprar um dos modelos? Bom dia, Os modelos são gratuitos. Basta imprimir as explicações. Bonjour Annick, vous tricotez 1 côte mousse (= 2 rangs endroit) en ajustant le nombre de mailles (augmentez/diminuez en fonction de la taille) au 1er de ces 2 rangs. Bon tricot! Hoi Jannie, Het hangt er vanaf welke maat je wilt gaan breien. Je hebt 950-1050-1100-1250 gram nodig voor respectievelijk maat S/M - L - XL - XXL. De bollen van eskimo zijn 50 gram, dus bijvoorbeeld voor maat L zou je 21 bollen nodig hebben. K had jullie gevraagd waar de maat tabellen stonden, en werd toen doorverwezen naar de patroontekeningen aan de onderkant van het patroon, en een link naar hoe je een maat kan kiezen. Wat nou als het een volledig ander model trui is waar je mee moet vergelijken?? Ik vind het dus vreemd dat jullie geen algemene maattabel hebben (zoals ik die ken van alle andere brei/haak/naai bladen/patronen) die van toepassing is op jullie patronen.